Kenny Everett (1944-95) was one of the most popular radio presenters ever to emerge from Britain, a regular on the airwaves on various stations for decades, but that was not only where he was to be found, as come the nineteen-seventies producers sought him for television appearances as well. The Liverpudlian DJ proved a hit on the BBC's flagship pop music show Top of the Pops, once he had been snapped up for the new Radio One from the now-illegal pirate broadcasts from ships off the coast of the British Isles, but his style, often described with such words as "wacky" or "zany" meant viewers were practically guaranteed. That was the idea, anyway, yet those early seventies programmes were not something he was particularly happy with, preferring his radio work (though not when he got fired) where he could create wild soundscapes of comedy characters, spoofs, inventive jingles and the pop records of the day, which was not quite like anyone else on the radio, though he had a few imitators by and by. Come 1978, Thames Television asked him to front another pop show, but this one was tailored more to his personality and akin to his radio endeavours, mixing the big music names of the decade with cheap as you like sketches and irreverent links. 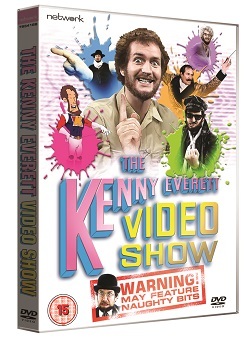 The Kenny Everett Video Show was an instant hit, both with the kids who loved his sense of humour, and the parents who could appreciate the music, which tended to be pitched to an older age group. The first series also introduced the dance troupe who became a good reason for the nation's dads to tune in, choreographer Arlene Phillips' Hot Gossip, consisting of three or so black blokes and what seemed like two dozen white ladies, all suggestively gyrating but getting away with it because they were not strippers, and did exhibit talent in the terpsichorean field. They were an obvious rival to Top of the Pops' dancers, who at that time were Legs & Co. Yet Legs & Co were somewhat more wholesome in demeanour, and Hot Gossip designed to inflame lust more blatantly, especially when Kenny would introduce them as such, emphasising you the viewer were about to see "naughty bits!" which may look rather tame now, but were pretty saucy for the grey seventies audience in their sitting rooms, assuming they could watch if there wasn't a power cut or strike going on. Take your entertainment where you find it, as they say. The girls would also appear to mime to Everett's jingles in some of the sketches and interstitials, and quickly became the making of the programme. Or at least they would have been were there not another ace up Everett's sleeve: Captain Kremmen. These animated adventures were patterned after the serials of his youth, or the science fiction comic books that aimed to imitate the American material which seemed more exotic to Brits. Cosgrove Hall, the Manchester studio, made what had originally been featured every day on the radio into cartoons that matched the japes their creator had concocted, a barrage of spoofy imagery, often in dubious taste belying their usual work in children's television such as Jamie and the Magic Torch or Chorlton and the Wheelies; their world-beater Dangermouse was in the future. Kremmen, self-described as The World's Most Fabulous Man, was the sort of macho hero Everett plainly wasn't, and that was the joke, though he and his writers Barry Cryer and Ray Cameron (father of stand-up Michael McIntyre) mined every double entendre they could for the character, accompanied as he was by curvaceous Carla and the Teutonic Dr Gitfinger, whose spectacle lenses helpfully spelled out the plot points or simple added more quips. In the first series, they battled the Thargoids who were intent on, um, destroying Planet Earth or something, with encounters with the Mud Men and the President of the United States along the way. Then there was the music, all provided by acts and artistes who admired Everett: he had initially made his name as a pal of The Beatles, accompanying them on tour to record bits for his radio broadcasts and producing their Christmas singles distributed to the fan club. This clearly made him one of the good guys as far as the pop and rock performers were concerned, and they were happy to contribute to the Video Show, with Elton John appearing in brief clips and acts like The Moody Blues, Bryan Ferry, Suzi Quatro, Kate Bush and Darts turning up to perform. Not much different to other ITV pop shows like Supersonic or Shang-a-Lang, really, but the presence of Cuddly Ken lifted it. He also included regular chances to see clips not often viewed, such as Cliff Richard on Oh Boy! in the sixties or old adverts like dancer Ann Miller's canned soup commercial, a forerunner of the clip shows that would be fronted by Clive James or Chris Tarrant. In that first series, there were even the occasional forays to the wider world of celebrity, of most interest being a setpiece at a London swimming pool filled with foam where seventies stars Robin Askwith, Tim Brooke-Taylor (of The Goodies) and Janet Brown (impressionist of soon-to-be-Prime Minister Margaret Thatcher) were asked the most difficult question in the world and dunked if they could not answer. The '78 series was such a runaway hit - and cheap, too - that a second was commissioned, beginning with a New Year's Day edition for the Festive season where Rod Stewart was the main guest, singing live and indulging in tomfoolery with Kenny. This was the first of three New Year's shows Everett did for Thames, acting as a curtain raiser to series two, which continued much as before. Everett's liking for character comedy, albeit characters delivering highly corny gags, was much in evidence, Sid Snot the most prominent, a black-clad rocker whose humour was mostly devoted to violence - he spent most of his earlier appearances smashing various objects. Other characters, aside from Kremmen, were Marcel Wave, introduced in the '79 series, a French lothario forever swigging champagne and making with the saucy double entendres (Kenny sported a plastic half-mask complete with waxed moustache to disguise himself - unconvincingly) and a baby in a pram, whose quips were among the series most groanworthy, mostly funny because everyone was aware of the fact, combined with Everett's helium-assisted voice. There was also Angry of Mayfair, a perpetually furious moral campaigner who wielded an umbrella and whose three-piece suit was revealed as a front for his ladies' underwear-clad back, a skewering of hypocrisy. The musicians continued to appear, as diverse as Hot Chocolate, Gerry Rafferty, Elvis Costello and two showings by David Bowie, who also did a comedy bit with Everett and a rendition of his breakthrough hit A Space Oddity was plainly the inspiration for his classic 1980 Ashes to Ashes video, down to using the same sets. Cliff Richard was only too pleased to turn up, both for performances and self-spoofing sketches, as was David Essex who dressed up as what looked like Sid Snot's brother (and was pretty amusing to boot). Freddie Mercury did the same, not speaking but launching himself into Kenny's arms for an enthusiastic play-fight (they were great pals offscreen). Come the final series in 1981, renamed The Kenny Everett Video Cassette, the strain was beginning to show. There remained some ribtickling bits, with a greater reliance on celebrity guests, so a personality was "gunged" every episode (e.g. Michael Aspel, Lennie Bennett or Terry Wogan), and they were in sketches too - Billy Connolly especially good value. But the budget was even lower, the cartoons axed and much to the team's chagrin it was aired opposite Top of the Pops, so there was no way it would succeed in the ratings and Everett and company decamped to the BBC to arguably even bigger success for the rest of the eighties until it was ended in 1988. Although the humour was rarely razor-sharp, relying on creaking gags you just knew Cryer was too fond off to leave out, and by modern standards some of it near the knuckle with stereotypes you would never get away with now, what blessed the entire thing was Kenny Everett himself, encouraged by the laughter of the crew - not an audience. He was a curious mixture of the innocent and knowing, an essentially camp figure who presented himself as a big kid with a toy box of video effects, costumes, stooges and a willingness to say, "To hell with it!" and follow his own imagination. Moreover, he was immensely likeable, curiously vulnerable with it, which made the nation warm to him when it was clear he simply wished to entertain. Sit down and watch this, said his TV show, it's silly and entertaining and a little naughty, you'll forget your worries for half an hour. He was a true original.